It's a Cluedo Whodunnit? Episode! As Homsar would say: "I'm just in time for the Murder Mystery!" Coooool. I played another hour of Indiana Jones and the Fate of Atlantis and at least according to HowLongToBeat.com, I'm about 25% in (it apparently takes 8-9 hours to complete the game). I'm at the stage where I've just finished up what I had to do in Monte Carlo (basically duping a guy to part with one of three Atlantean artifacts: a stone disk) and now wandering around Algiers. The game seems to have some flexibility when you approach puzzles since you often get a choice of whether you want Indiana Jones to solve it or Sophia (or sometimes both). I've yet to see what the ramifications are for the story as a whole when picking one over the other but that's something I guess I'll check out once I've finished the game. 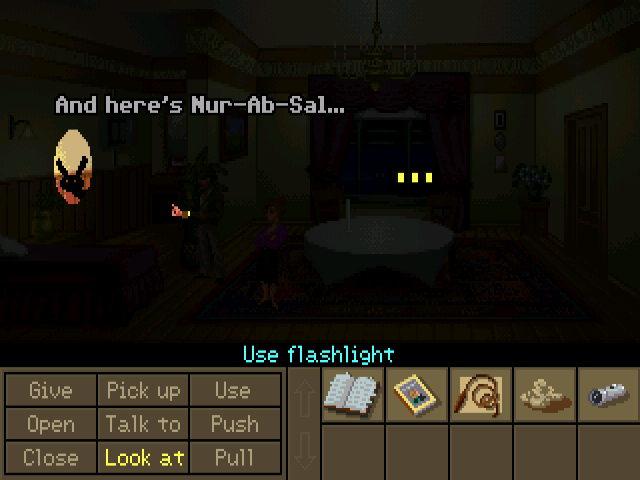 I also like the fact that Sophia acts as a walking hints guide or at the very least is there to remind you of what your current objective is - it makes it easier coming back to a 90s adventure game after being spoilt by Telltale adventures where there's pretty much no puzzle solving at all. I also like the fact the game is broken up into stages so in general there are very little "rooms" to explore (since having access to lots of rooms increases the difficulty of an adventure game). Up to Stage 10-2 after 1 hour and I'm now at the penultimate "master" (apparently). I like this current master who is an owl called "Hu" because he grants the "Zen ball" ability which are basically balls with auto-aim on (ZOMG H4X! ): it's just what I need considering how bad I am at aiming in this game.